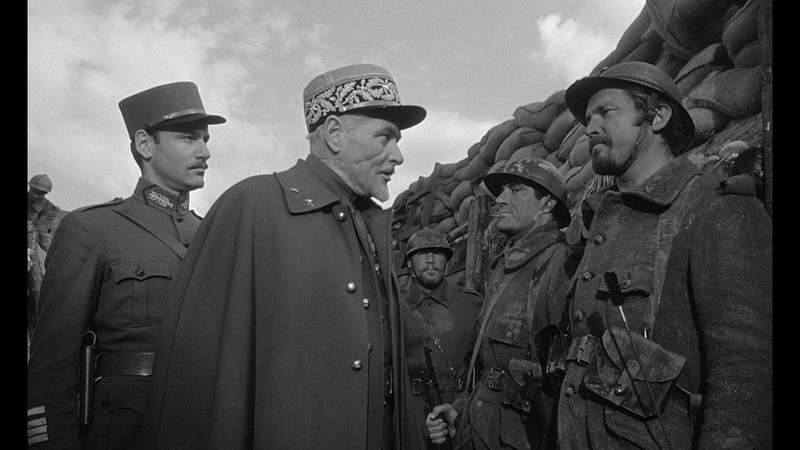 An anti-war film exposing the hubris of generals, Paths Of Glory is a devastating indictment of useless slaughter. At 29 years old, director Stanley Kubrick startles with bravado camera work, bringing to life the grim trenches of World War One. It's 1916, and the Great War between Germany and France has settled into a stalemate, both sides dug into trenches and unable to achieve meaningful breakthroughs. On the French side, Major General Georges Broulard (Adolphe Menjou) convinces Brigadier General Paul Mireau (George Macready) to launch an attack on a fortified German position known as the Anthill. The attack has no chance of success and will result in a large number of casualties. Broulard dangles the possibility of a promotion in front of Mireau, and the latter overcomes his initial reluctance and accepts to throw his men of the 701st Infantry Regiment into a battle they cannot win. Colonel Dax (Kirk Douglas) is the commanding officer of the 701st, and despite deep personal misgivings follows orders to launch the attack, personally leading his men into battle. It is hopeless: the French troops are gunned down en masse within yards of their own trench, and are forced into a rapid retreat. Many troops refuse to join the attack once the outcome is clear. None of this matters to the humiliated Mireau: he demands that three soldiers from the 701st be tried at court martial and executed by firing squad once found guilty of cowardice. Corporal Paris (Ralph Meeker), Private Ferol (Timothy Carey) and Private Arnaud (Joe Turkel) are the unfortunate soldiers chosen as scapegoats to represent the failure of the Regiment. Dax decides to defend the actions of his troops, and appoints himself defence counsel for the three terrified men. While most acts of war represent the unforgivable squandering of lives and resources, ill-conceived military actions launched to satisfy the egos of generals are the depth of incompetence. 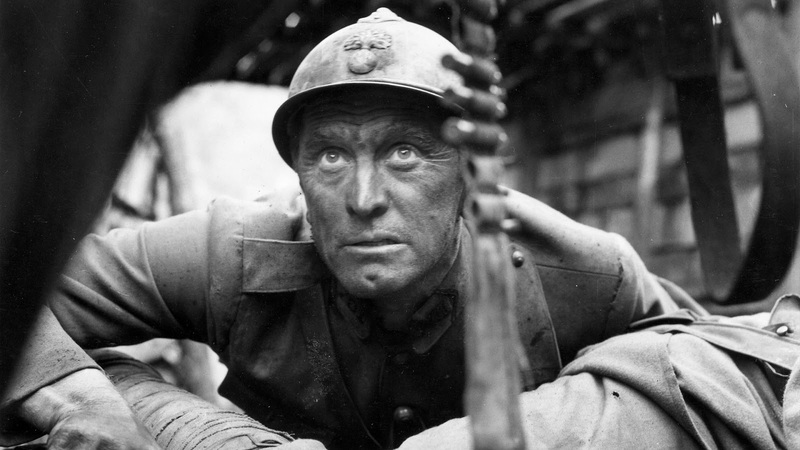 The French army with its antiquated methods made it through World War One, but without modernization it was hopelessly crushed at the start of the Second World War, and Paths Of Glory shows at least some of the reasons why. The adaptation of the Humphrey Cobb book (with a screenplay co-written by Kubrick) provides a quick recipe for destroying morale, and leaves no doubt that blame flows downhill, and rapidly. Soldiers who are nothing but brave and loyal are made to pay for the misguided delusions, naked ambitions, and bungled plans of their generals. And those who miraculously survive the horrors of battle are then subjected to the humiliation of being branded as cowards and failures, with the unlucky few killed by their own army, theoretically as examples and warnings to others. In the meantime, the generals accept no responsibility for their actions, and stay busy duping themselves into believing that the failure was simply a matter of poor execution by the troops. In the most static of battlefield arrangements, Kubrick uncovers exceptional motion. 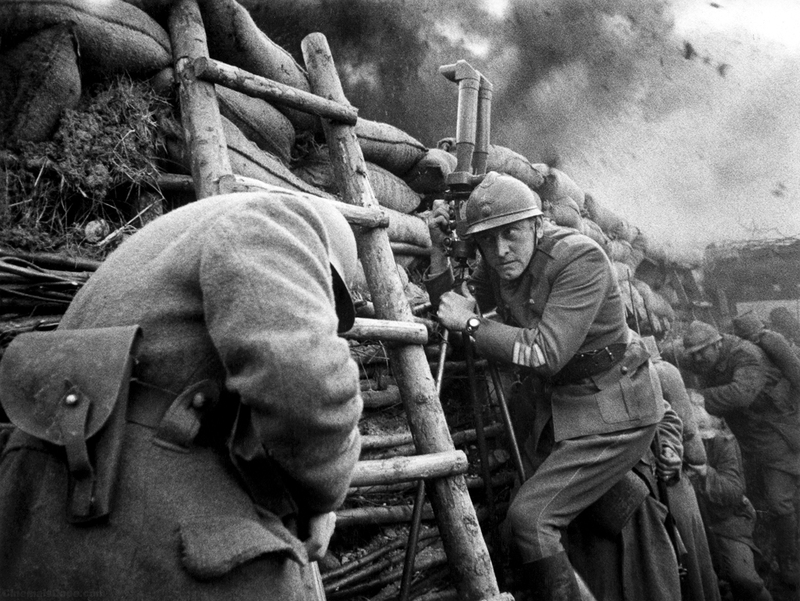 Most effective during a long sequence as Mireau visits the trenches to meet the troops and prep them for the attack, Kubrick demonstrates a sophisticated eye for unleashing dynamic energy in a mundane act. Kubrick's perspective stays ahead of Mireau and moves backwards with stunning fluidity, keeping a steady distance to the advancing Mireau, stopping only when the general stops to chat with selected soldiers. The seemingly infinite trench environment and the exhausted men living within it are introduced from both peripheries of the screen and brought towards the centre as the camera continues to back-up, endless walls of mud built to sustain an endless war. The only thing worse than being in the suffocating trenches is being under fire outside the trenches. When the attack is launched and the men of the 701st Regiment haul themselves over the walls and follow an artillery barrage towards the German lines, Kubrick's cameras are right there, moving slowly with the men now exposed in a chaotic no-man's land filled with smoke, explosions and gunfire, the troops suffering cruel punishment from their own artillery shells and the German machine guns while Dax's whistle tries vainly to egg them on. Kirk Douglas as Colonel Dax finds the thin line between loyalty to his superiors and defending the honour of his troops. Douglas conveys a jaded spirit more ready to fight the battle that matters against internal incompetence rather than a justify a hopeless skirmish with the German enemy. George Macready and Adolphe Menjou, in one of his final roles, are both excellent as they bring pompous incompetence to life. Meeker, Carey and Turkel as the three soldiers picked to stand trial are adequate if somewhat overly theatrical. War is hell, no matter how just the cause. Treating men like so much disposable cannon fodder adds certain moral defeat to the most disheartening of human endeavours.